Preservative Free Whole Leaf Aloe Vera Juice (32 oz)- Save-On Nutrition Centre Ltd. 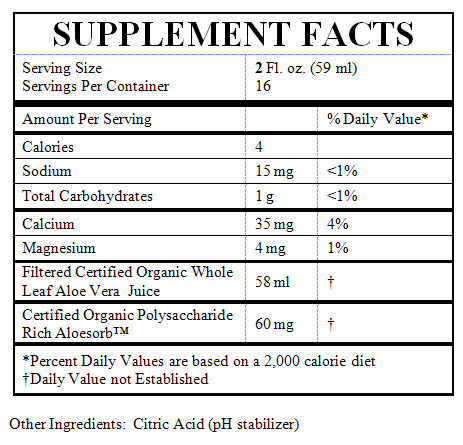 The Preservative Free Aloe Vera Juice products with Aloesorb™ has been clinically demonstrated to improve the efficacy and vast health benefits of aloe vera including: increased absorption/bioavailability of vitamins and nutrients, increased immune support, enhanced antioxidant support, and reduction of nitrate levels. Other benefits consumers enjoy in Lily of the Desert aloe vera products include: support of a healthy digestive system, help in sustaining and promoting healthy regularity, and help supporting normal muscle and joint functions. Lily of the Desert's Preservative Free aloe vera juice product line has set a new standard in the aloe vera industry by providing consumers the first and only USDA Certified Organic aloe vera juice. These products contain the full range of health benefits found in Lily of the Desert aloe vera products while not having the preservatives. Without preservatives, the juices have a cleaner, and lighter taste. Drink 2-8 ounces per day or as needed. Additional sugar, starch, or water. This product is a natural product; therefore the color may change slightly due to seasonal variations without effecting purity, efficacy, or quality. Refrigerate immediately after opening.